If you haven't used CoughDrop then you might not know just how powerful its reporting tools are. Communicators can turn on logging, and then detailed reports on communication over time are available not only on the communicator's device, but also through the cloud to the rest of the support team on their own devices. We love data! How about you? This can make a huge difference in intervention, since the reports can be used remotely to track daily or weekly progress, support more fine-grained student goals, and provide greater awareness and accountability for everyone supporting the communicator. Honestly it's one of the things people get most excited about when they see CoughDrop for the first time. Seeing word sequences by parts of speech is pretty cool. 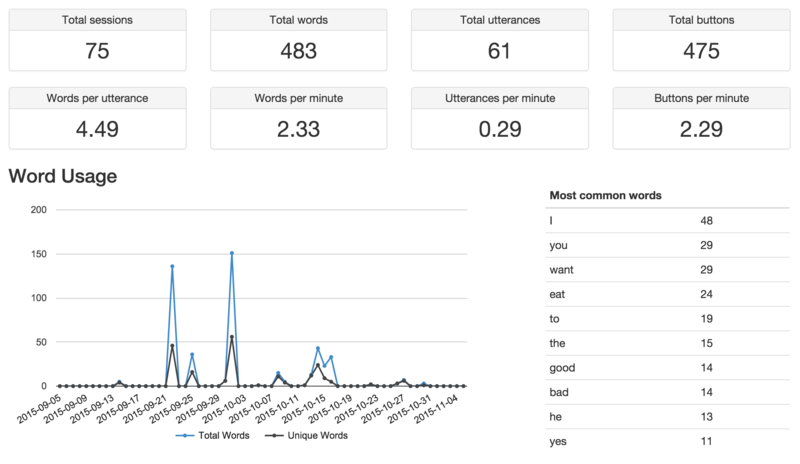 CoughDrop can classify words based on their matching parts of speech, and the reporting tool now includes a breakdown of what word types a communicator is using, as well as a flow chart that shows how they are typically combining words in a sequence. This can be great for goals that focus on expanding sentence length or introducing new word types. Someone's forgetting to use their device on Saturdays..
We've also added a punch card-style report to show how often CoughDrop is typically being used throughout the week. CoughDrop has had location-based reports for a while, so you could already compare usage at home vs. school, but the new time-based report gives a little more detail to help look for areas of improvement. Who doesn't love a good word cloud? CoughDrop reports have also always shown word frequency, but we've added a new word cloud option for people who prefer pretty things like colored words all tumbled together. In all seriousness, word clouds can be a helpful tool for showing vocabulary changes over time, or for a more at-a-glance summary of communication. Remember, you can always try these reports out for yourself by signing up for a free trial of CoughDrop. Looking for even more? We definitely have more in store! We'd love to hear about your ideas and see how we can incorporate them into our continually-improving communication app! Thanks again to everyone who's helped us get this far!